Almost two centuries ago, our neighborhood Reformed Church was the Market Square Church, one of the earliest (1733) German Reformed Churches in America. However, the services there were spoken in German. There was high hope on the part of some that the next pastor would preach in English. But another pastor from Germany had agreed to come, and the older members if the Church stipulated that it must be on condition that all services be in German. This situation had much to do with the origin of First Church, for young people at this time no longer knew German very well and therefore had little participation or interest in the Market Square Church. The idea of organizing an English speaking Calvinistic Church quickly crystallized. There was already a definite constituency for such a Church since some more years a group had been meeting at the home of the Rev. 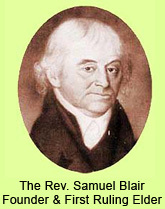 Samuel Blair, on Sunday afternoons for the benefit of his expositions of the Scripture. Dr. Blair was a distinguished clergyman (born 1741) who, at the age of 25,had been a colleague of Dr. Sewell of the Old South Church in Boston. Because of poor health, he gave up his Pastorate in Boston and came to live at his wife’s home in Germantown. While at Boston, he had been called to the presidency of the College of New Jersey (Princeton University), but resigned in favor of Dr. John Witherspoon of Scotland. 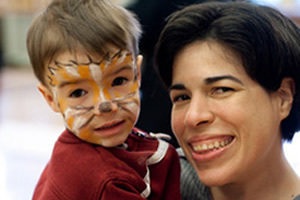 No account of an actual organization of our Church can be found. There is a record in the Presbytery’s Minutes for October 10, 1810, when Rev. Thomas Dunn, a Baptist lately for England, was received by the Presbytery, that since he had “for of the people, it was agreed that he should be regularly appointed to preach for the new Church.” Because of this record, it was decided at our Centenary Celebration in 1909 to take October 17, 1809, as the date of our organization. Early in 1811 subscription books were circulated in behalf of a church building. 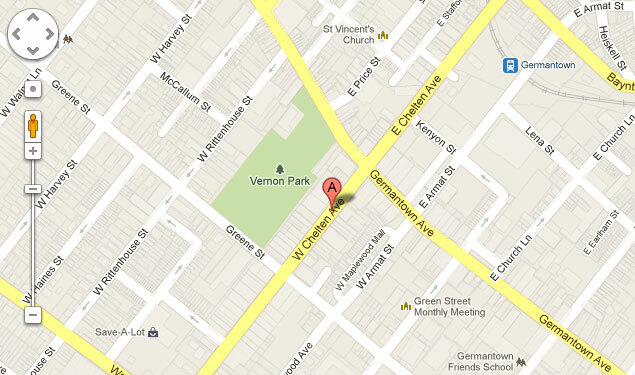 A site was chosen on Germantown Avenue, between Haines and Rittenhouse. Ground was broken on August 5th and the cornerstone laid September 10th. The total cost of property and building was $17,000, for which the group was not prepared. They had “over built” and serious indebtedness hung over their shoulders for 27 years. The Presbytery was asked several times for financial aid, but none was forthcoming. Under the leadership of the Rev. 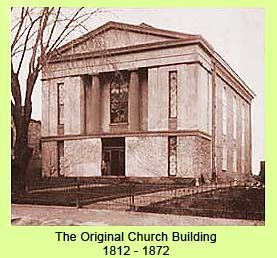 William Neill, the Church secured a new Charter (1832) in which the Church received its present name,”The First Presbyterian Church in Germantown.” And in 1836 we became “free from all debt whatever” – for the first time. The Rev. J. Frederick Dripps (pastor 1870-80) came to us at a time when there was great quickening of spirit on Presbyterian Churches. He devised our Pastoral Aid Society, which was an original plan for women’s Church work, and which was adopted by many other Churches. It was at the beginning of Dr. Dripp’s ministry that our Church sold its Germantown Avenue property and established itself at our present location, with the construction of a new house of worship. All pew rents were abolished, and a budget with voluntary subscriptions successfully established. Committees from the newly modeled Pastoral Aid, organized a Sunday School at Pulaskiville in 1870 (which became the Westside Church in 1892); and at Somerville in 1874 (which became the Church of the Covenant in 1910). During the pastorate of the Rev. Charles Wood (1886-97) our membership passed the 1,000 line and grew so rapidly that an enlargement of the church auditorium became necessary. In 1888 the West Transept was built followed by the East Transept in 1892 to further accommodate the growing needs of the Church. The Rev. Charles R. Erdman was a pastor with strong Christian leadership and influence from which many of us today have been greatly benefited. In 1894 he began his Sunday Afternoon Addresses to Railroad Men at the Penna. R.R. Y.M.C.A. This volunteer service continued for 15 years, as he inspired thousands of young men. The long and distinguished pastorate of the Rev. 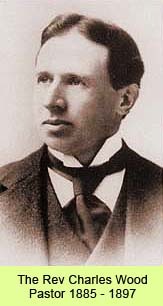 William Beatty Jennings (1906-35) is still very real to many of us, the high character of our Church in being confirmed in the course which we are still pursuing. A big event of Dr. Jennings early years was the Centennial Anniversary Celebration of the founding of First Church with enthusiastic participation of the entire congregation. The beloved Rev. John Clark Finney, who came to our church in 1928 as an Associate Pastor with Dr. Jennings, gave 28 years of devoted service until his retirement in 1956, at which time he became our first Pastor Emeritus. During the pastorate of the Rev. Sherman Skinner (1936-47), First Church continued to expand, its membership reaching a new high of more than 2,000. Because of its location and its growing influence in the community it became known as the “Church at the Crossroads.” Dr. Skinner’s ministry brought new life to the work and witness of First Church and in testimony to his leadership much of the program and many of the organizations which he encouraged are still an important part of the life of the church. With the coming of the Rev. 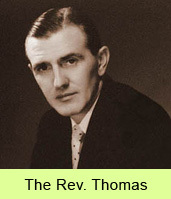 D. Reginald Thomas, from Wales in 1955, First Church experienced ever increasing opportunities to witness to a far greater congregation though out the area. Overflow crowds at the worship services led to the use of radio and television and Dr. Thomas became widely recognized through an active radio ministry, “The Bible Study Hour.” During his ministry (1955-65) First Church received wide recognition for its outstanding music program under the direction of Robert Cathwithen, creating a tradition which continues to set apart the program of First Church in this community. In 1967, the call to the Rev. Aaron E. Gast, brought to First Church a continuing high standard of preaching and a new awareness of the role of the Church in the community. During his fourteen year ministry, in 1972, the Westside Presbyterian Church merged with First Church. This significant union, initiated by the minister of Westside, the Rev. 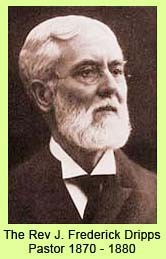 Gordon L. Roberts, and through a cooperative spirit on the part of both congregations, produced a strong, cohesive church. Through the joint leadership of Reverends Robers and Gast, roots off the two congregations grew together to nurture a new witness. During this time, leadership was representative of both original congregations, and the traditions of both became the traditions of all. For the next two decades, Dr. Griffin and later Dr. Simpson continued the traditions of meaningful worship, outstanding music, community involvement and pastoral care to the congregation and community. 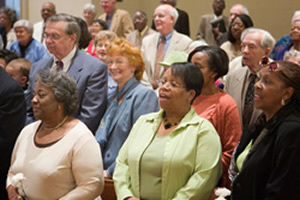 Various new forms of worship have been used and both traditional and contemporary church music has been enjoyed during worship. 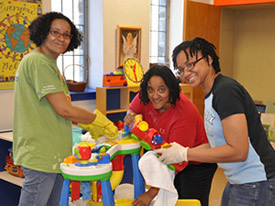 The First Presbyterian Church in Germantown, today, has steadily developed urban ministry and an increasingly integrated congregation. 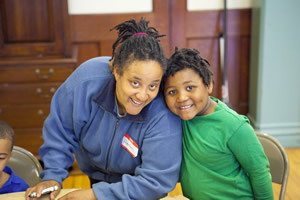 It is changing from being a church with a primarily white middle class membership to one with members and leaders coming from the various social and racial groups of the immediate neighborhood.